Warner Bros. have reported that one of their goals is to reach out to the tournament fighter crowd, and there are definitely small nuances reflecting this. First hit notification and combo hit counters with damage percentage readouts are all present along with their own take on a super meter. Once the meter is full, fighters are able to launch spectacular bone-breaking attacks complete with X-Ray vision of organs and ribs being forcibly rearranged with surprising ease. For Johnny Cage it was simply pushing R2 and L2 on the Dualshock. The backgrounds are also just as complex as you remember from the old games, being able to watch fights happen on a bridge in the background and those creepy trees still howling in the wind, all brought to life in a very impressive high definition complete with the “Toasty” guy. Throughout the fight, the combatants take damage ranging from scratches and bruising all the way to chunks of flesh dangling off Scorpion’s chest. The damage seemed to be scripted and not a direct representation of damage being taken, but was an impressive touch nevertheless. While neither of us were talented enough to pull off a fatality, I did get a chance to see Cage uppercut Mileena’s head right off of her shoulders, which were promptly removed with the rest of her torso. Mortal Kombat has never been short on class. For those of you with 3D televisions, this is a great way to show it off with the added benefit of still having friends being able to watch. Unlike most 3D games that are destined to give anyone watching without the glasses a migraine, the fighters have been rendered in 2D with the background getting the 3D treatment. The background will appear to be blurry, but the fighters themselves will look just fine. Mortal Kombat seems intent on making a run at the fighting game crown, and from first impressions it certainly seems like it has a chance. The story mode feels more like something out of a Futurama episode than a fighting game, with players going back in time to the events of the first Mortal Kombat altering past events. And quite frankly, if a sentence that includes both Futurama and Mortal Kombat doesn’t bring up some nerd excitement for you, I don’t think I have anything to offer you. 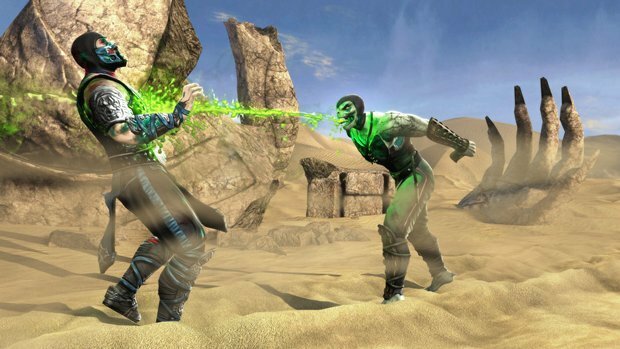 Mortal Kombat comes out for the Xbox and PlayStation 3 on April 19th, but PSN gold members will be able to get their hands on the demo Wednesday. So, now that I’ve properly called dibs on Sub Zero, who’s up for a fight Wednesday? Oh, and just a little heads up, a little birdie told me that you may get a little secret if you finish the ladder mode in the demo. You can say “thanks” later.